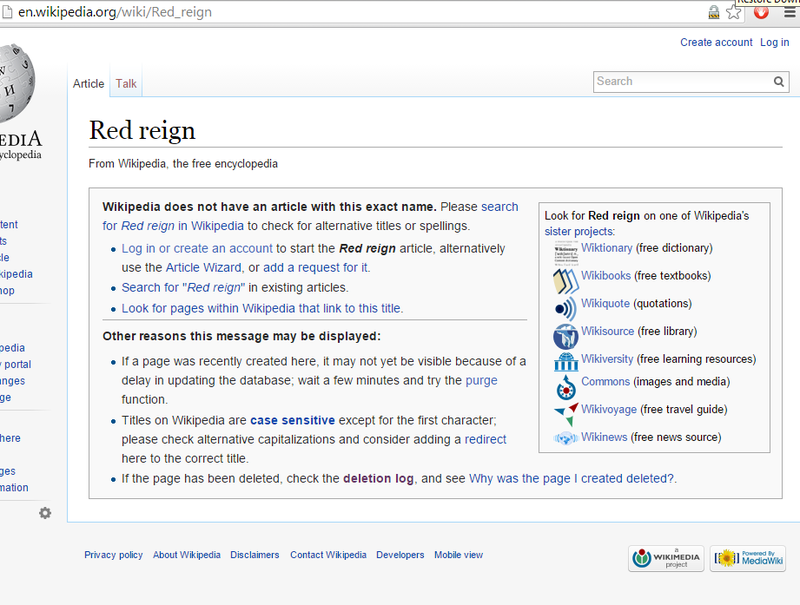 Not too long ago, it was possible to read about the documentary "Red Reign: The Bloody Harvest of China's Prisoners" on Wikipedia. But now it appears that the page never existed. I'm showing my work below (i.e. 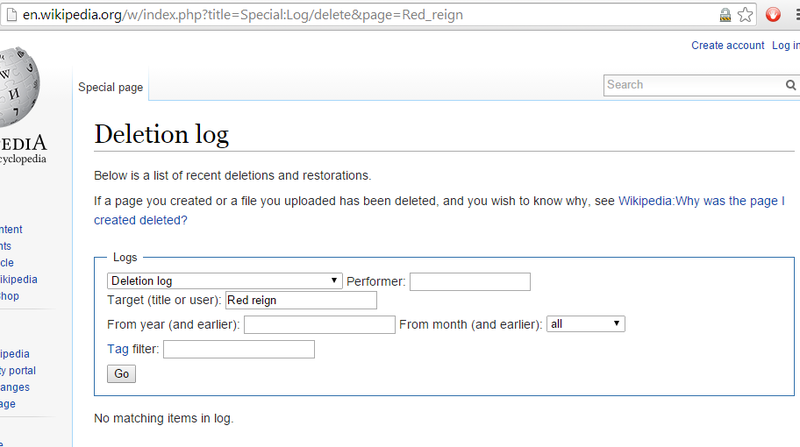 the wikipedia result, the wikipedia deletion log result, and the wayback machine result). The basic theme of the documentary is that the Chinese Government is participating in (1) the killing of prisoners whose crime seems to be their membership in the peaceful Falun Gong sect, (2) the harvesting of their organs, and (3) the sale of those organs to foreign patients, not necessarily in that order. 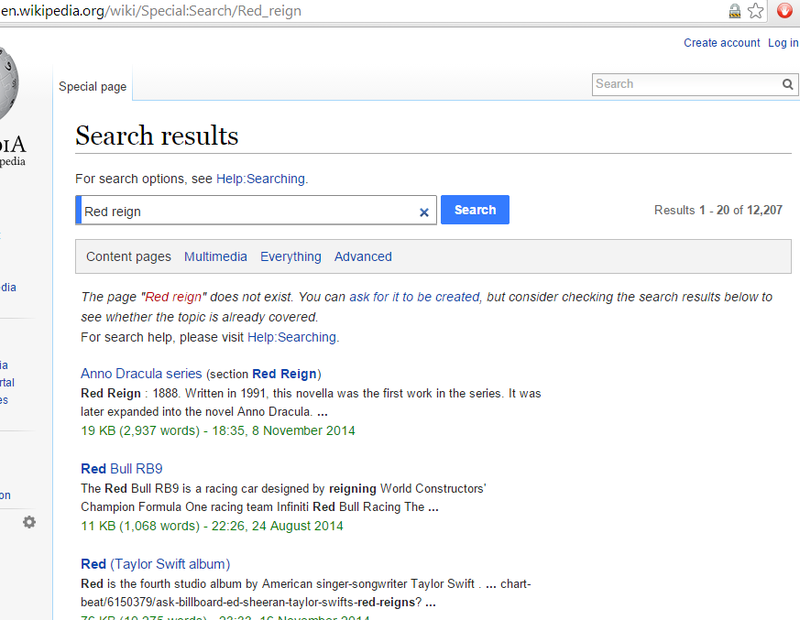 You can, and should, watch the trailer for Red Reign here on Youtube. "Basically the Chinese government arrests the Falun Gong practitioner, tortures them until they confess to a capital crime, then they are incarcerated doing slave labor until the people who purchased their organs arrives, then the Falun Gong has their organs removed and put in the buyers. The buyer is told the prisoner was going to be executed anyway. 70 M practitioners. 2-4 M in slave labor camps. 2000 liver transplants in 2005 according to Chinese government statistics. If this is true, it certainly is an argument not to buy 'Made in China.'" "A hard to watch must see if you care enough to make ethical decisions. Not exactly the best documentary production but none-the-less the topic and subjects make for compelling watching and listening. It made me think twice about doing any business or travel to China. Have suspected these types of human rights violations existed but had no idea how systemic they are, nor how complicit the rest of the world is in ignoring or even participating in them. The poem at the end is an ominous reminder of the issues that can arise if we ignore these atrocities! I was discussing the 40,000 children that are stolen or go missing in China every year the other day and we where left wondering why the government and the people do nothing about that issue. This documentary helps understand why that issue too is not addressed. Public opinion is so depressed and controlled that there is no internal willingness or pressure to change. If you are particularly sensitive to human suffering you probably should avoid watching this movie." Here's piece about it on NaturalNews. I see the piece has a link to "real time streaming" of the movie, but I didn't click the link. Sorry, I don't completely trust the site, because it has a number of ads. If you test the link and it works, let me know! You can watch the film on Amazon Instant here. You can watch the film on Hulu here. Here's an interview with Masha Savitz, the writer-director, who incidentally does not have a wikipedia entry either. "David Matas is the co-author of Report into Allegations of Organ Harvesting of Falun Gong Practitioners in China, which alleges that since 2000 the Chinese government has been systemically harvesting organs from Falun Gong practitioners. He is also counsel for Justice for Jews from Arab Countries and is co-author of "Jewish Refugees from Arab Countries: The Case for Rights and Redress". In 2009 David Matas was a signatory to a letter that opposed the appointment of Professor Christine Chinkin to a UNHuman Rights Council fact finding mission regarding the potential that Israeli and Hamas engaged in war crimes during the 2008-2009 Gaza War on the basis that Chinkin signed a letter prior to the fact finding mission that Matas claims showed that she "concluded that Israel was acting contrary to international law." Chinkin was not dismissed from the fact finding mission and went on to help produce the Goldstone report. He presented various papers on the legal issue of prosecuting war criminals in Bangladesh. In 2010 David Matas was nominated for the Nobel Peace Prize for his work related to the investigation of organ harvesting crimes against Falun Gong practitioners in China." "Red Reign examines the shocking evidence of forced organ harvesting of China’s prisoners of conscience, the practitioners of Falun Gong. "Falun Gong, a spiritual practice rooted in Buddhism and introduced to the public in 1991, was banned by the Chinese Communist Party (CCP) in 1999. Hundreds of thousands of practitioners were arrested, imprisoned and brutally tortured if they did not recant their beliefs of ‘truthfulness, compassion and forbearance.’ In 2006, a report by human rights lawyer David Matas, as well as David Kilgour, a former member of the Canadian Parliament, alleged that Falun Gong prisoners were being killed in order to harvest their organs for the lucrative government-run transplant business. "Filmmaker Masha Savitz zeroes in on the efforts of the Nobel Prize nominee David Matas, who wrote the book ‘Bloody Harvest: The Killing of Falun Gong.’ Featuring interviews with Matas, David Kilgour, victims of the Falun Gong persecution and several doctors who share chilling transplant testimonies, as well as a filmmaker whose film on the topic was effectively quashed by the CCP in Canada, Europe, and the US, Red Reign makes a stunning case. An international story of tangled politics and economics intentionally suppressed by the Chinese, Red Reign shows how a large scale persecution of a minority people can still happen in our modern day society." I have no idea whether the documentary is true or not, in whole or in part. The allegations are horrifying. It would be very interesting to know why it's not on Wikipedia anymore. Was it merely a victim of a systematic wikipedia purge of publicist-created entries, or -- more sinisterly -- was the Chinese government behind it? And if the Chinese government was behind it, where was our government in all of this? 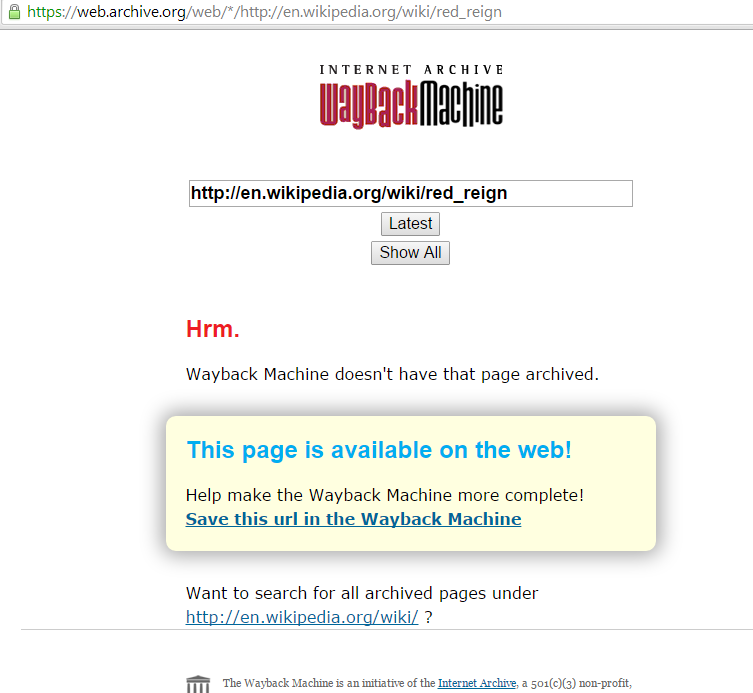 And the wayback machine just tells me that the page still exists. I thought it was supposed to give me information about what the page looked at "way back" then.